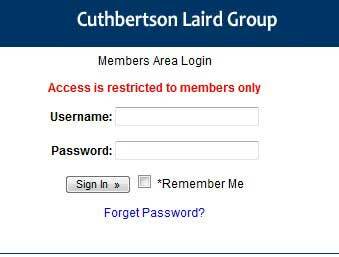 Cuthbertson Laird offer the option of an 'electronic copy' of the calibration certificate, which is downloadable from our website direct to any PC. Hard copies of the certificates will still need to be kept and produced for inspections etc. The electronic option is especially attractive to those of our customers who travel from site-to-site, even possibly abroad, and need to prove that the equipment they will be using has a valid calibration certificate. Secure and Convenient - download a cal cert anywhere, anytime. Secure files that only registered members can access and download. Control who has access to your download files. Requires verification sent to given email address. Auto-email of lost password on Login page. Documents can be in PDF, Word and Zip file formats. Click on the image to be redirected to the login page. Lost your calibration certificate? Just contact the office where you had it calibrated. They will be able to provide a replacement copy.